Maddie Ballet 40cm Rag Doll wears a pink tulle ballet dress sprinkled with sequins. Pink tulle petticoats support her skirt and pink satin ribbons add that extra touch. Maddie Ballet 40cm Rag Doll has cream wool hair caught up in a ballet bun. Her sweet embroidered face has brown eyes. Her dress is not removable. 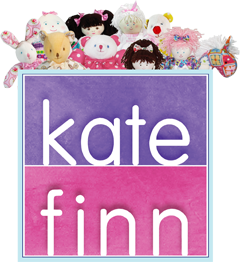 Maddie Ballet 40cm Rag Doll is one of the characters in Kate Finn’s series of short stories about The Finnies so make sure you treat your little ones to lot’s of fun watching Kate Finn’s YouTube Channel!